People tend to think of all-inclusive resorts as destinations for romantic getaways, while they plan family vacations at cottages or theme parks. But a Mexican resort family vacation may well be the perfect compromise to make everyone in your family happy. Mexico is well known as one of the world's best family vacation destinations. All-inclusive family resorts offer a unique combination of amenities, great beaches and activities, as well as sense of cultural interest. Two areas in particular are known for striving to provide the best all-inclusive family vacations: Cancun and the Riviera Maya. 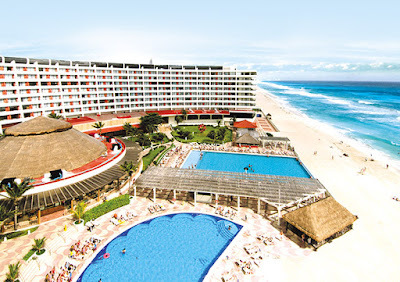 * Avalon Grand Cancun: Perfect for active families, the Avalon Grand Cancun is an all-inclusive family resort that rests on a 14-mile stretch of white sand beach within the Cancun hotel district. Kids have a blast at the Wild Things Kids Club, while parents can spend time eating and playing at the Avalon Reef Club. * Crown Paradise Club: Located just nine miles from the airport, this all-inclusive resort is ideal for families, as it is situated at the quiet end of Cancun's hotel zone. Crown Paradise Club offers everything you could ask for in your Mexican resort family vacation. There are four pools, boogie boards, mini golf and a supervised water park for children of all ages to enjoy. Considered to be one of the country's most notable resorts, Crown Paradise Club provides many complimentary amenities and the most comfortable accommodations. * Iberostar Cozumel: One and two-story bungalows comprise 306 rooms at the Iberostar Cozumel. This property offers tropical gardens, poolside snack bar, lounge bar, main restaurant, two specialty restaurants, a discotheque and a sport bar. There are a la carte restaurants with kids' menus, plus specialized children's programs and lots of room for little ones to play with their newfound friends. Iberostar Cozumel combines fun, luxury and adventure to create a Mexican resort family vacation you'll never forget. * Paradisus Riviera Cancun: This premier vacation property is a branch of the world-renowned Sol Melia chain. Pardisus Riviera Cancun is situated on the Riviera May, fifteen minutes from Cancun's International Airport, and about thirty minutes south of Cancun. Fourteen three-story bungalows and five hundred suites are all equipped with private terraces and complimentary amenities. The Paradisus Riviera Cancun provides special children's menus, programs and play areas, making it a great choice for your Mexican resort family vacation. All-inclusive resorts aren't just for grown-ups anymore. Enjoy the luxury and romance of a sunny getaway with the fun of a family vacation. Treat your gang to an unforgettable Mexican resort family vacation.